It's been a week since I've posted but it's been busy! I'll write about what I've been up to later though. I was lay in bed this morning, with my wife asleep next to me and our three children in the other bedrooms, thinking about how five years ago on this day (23rd) was the first morning in this place and our first full day here. 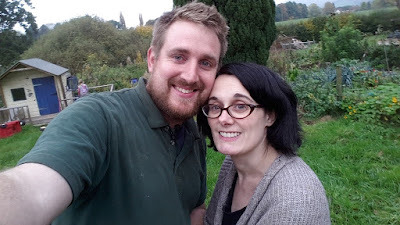 I don't need to write what's changed in our lives since then as I'm blessed to have made some lovely friends via this blog who get to share in all that we've done here and I'd like to thank you all for that. But I did want to write about one thing that hadn't changed in all that time and be a bit soppy for once. She is an amazing, clever, thoughtful, determined, funny, beautiful woman. She is an incredible mother to our children and wife to me, I can honestly say that no one knows me better than her or how to bring out the best in me. Early next year we'll have been together fifteen years, we met as late teenagers and grew and became adults together and have shared some truly amazing moments through our lives. I can't wait to wake up next to her on Christmas morning and enjoy what will be a magical day, but not without all the hard work that she has been putting into it each night for weeks. I know I have a lot to be thankful for in life but my wife truly is the heart of it. Well done Kev. And well done to you Mrs. Kev!! Aww Kev, that's beautiful...so lovely to see a bloke put his love for his wife and family right out there in public - not many would do that. Good on you. Hope you all have a wonderful Christmas. Oh my goodness, this put tears in my eyes---what a lovely tribute to your beautiful wife. What a great family life you have. Merry Christmas to you all! i agree with sue! more husbands should love their wives like you do! marry xmas to you and your wonderful family! Welling up a bit here. So lovely of you to express your feelings for the lovely lady in your life. Hope your day was magical.